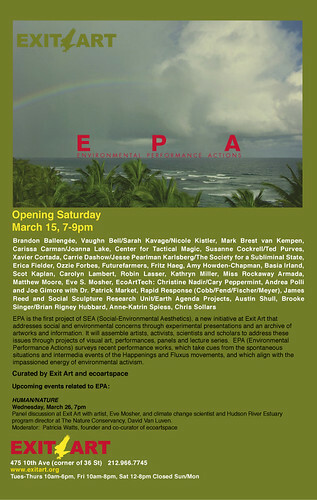 Right now, Miss Rockaway is participating in an art show at Exit Art in New York City. Please stop by if you have a moment. Then in April Miss Rockaway will present an installation in the MassMoCA Museum in Massachusetts. We’re currently floating down the Mississippi River performing shows every few days in different towns along the river. Check out the blog page for up-to-date listings. screenprinted by the Rockaway Crew! See the Amazing Slideshow! Don’t Forget to Dress Nautical: Pirates, Mermaids, Sailors, more! this time all the way to New Orleans! Rolling on the River, the art benefit on March 29 went really well! There are still a few gems for sale to benefit Miss Rockaway which you can view on flickr here. These include an incredible embossed speaker tree print by David Ellis of the Barnstormers and a collaborative print of Doze Green and David Ellis, as well as a few prints by the amazing Dennis McNett. also, much to our chagrin the Swashbuckler’s Ball party, which was scheduled for April 7, has to be rescheduled due to complications with the venue. Please check back for updates on the next event! New York (March 26, 2007) – The Miss Rockaway Armada will host a benefit art exhibit in New York City on the evening of March 29, 2007 at 6pm. The group is calling on artists and art enthusiasts for their support to send this scrap-raft flotilla down the Mississippi River. Currently docked for the winter at a biker bar in Illinois, this group of artists, performers, dreamers and doers from all over the country will get back on the water in June. The group hopes to raise funds for much needed motors, fuel, nautical equipment and transportation. The auction will feature performances by members of the Armada and art from the river itself including a life-sized story booth decorated by David Ellis & Swoon. The Armada project was conceived by street artist Swoon, and has been built and organized by a collective of 25 artists, performers and activists from New York, San Francisco, Seattle and Wisconsin. The collective floats down the Mississippi River on a 110 foot raft made of scrap materials. Last year they spent months gathering resources to build this floating home/art project, then floated from Minneapolis to Andalusia, Illinois; all the while stopping to meet people, share skills, perform, swap stories, and otherwise engage in cultural exchange. However, they have many miles to go before they reach New Orleans. The Armada is gearing up to tackle the Big Muddy again and are eager to see who and what they will encounter as they continue the impossible experience that characterizes Miss Rockaway. The group is creating a mobile cultural center that embodies their search for creative and sustainable ways of living. For information contact A’yen Tran at ayen@missrockaway.org. Ad Hoc Art is located at 49 Bogart St. in Bushwick, Brooklyn. The Armada project was conceived by street artist Swoon, and is now being built and organized by a collective of 25 artists, performers and activists from New York, San Francisco and Seattle. The Armada enjoys support from the Holasek-Weir Projects, the Wooster Collective and the Barnstormers art collective, who will donate a larger-than-life sound system sculpture that will float down the river. Send Our Hopes Down the River is presented in collaboration with Emergency Arts and Conjunction Arts, two organizations dedicated to promoting art with a social conscience. The event will feature a life-sized pontoon raft-stage, a skeptics’ raffle, performances by members of the Miss Rockaway Armada crew, and some exciting surprises. Select items can be previewed on woostercollective.com preceding the benefit. Bidding ends promptly at 9pm. The Miss Rockaway Armada includes members of the Toyshop Collective, Visual Resistance, The Amateurs, The Floating Neutrinos, The Infernal Noise Brigade, The Madagascar Institute and the Rude Mechanical Orchestra. This July they will converge in Minneapolis to construct a flotilla of rafts that will journey down the Mississippi River. The group is creating a mobile cultural center that embodies their search for creative and sustainable ways of living. For information on this event and The Miss Rockaway Armada, contact A’yen Tran at ayen@missrockaway.org. The Holasek-Weir Projects is located at 547 W. 21st near 11th Ave. in Chelsea.